They all arrived at one time in front of the house of the great chief; and before the canoes reached shore the princesses and chieftainess would dance down from the chief’s house toward the canoes. Then the leader of the dancers took his supernatural power and threw it toward the guests in the canoes. 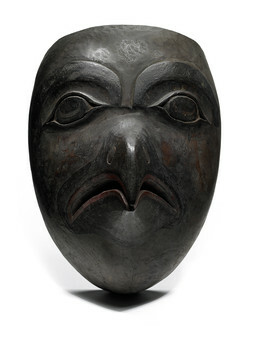 —Henry Tate, 1909-1910, from "Tsimshian Mythology"
Tsimshian individuals acquired supernatural powers, or helping spirits (naxnox), through a series of ritual initiations held by members of that spirit’s society. The spirits, like this bird, were represented by masks. During the initiation ceremony, holders of the power “threw” it into the novices so that it became theirs as well. Masks were kept hidden away except at ceremonies.